Session work at a recording studio is exciting, fun, and you get to meet all kinds of great people. “Hmmm, I really am a professional”. As a voice talent, you also understand the importance of being able to record from home. So you set out to put together your home studio. You get a good, large diaphragm microphone and a preamplifier for your mic. Heck, maybe you even skip the preamp and go right for a USB microphone. The fewer steps involved the better, right? You’ve got a good computer, it should be able to record plenty of takes. You are all set to go. But, something doesn’t sound right. It just does not sound the same as when you went into those professional studios. Where is that upfront sound that engineers are able to get out of your voice? When you sound great, delivering the goods seems easy. What’s worse, your performance is starting to suffer. It’s very hard to concentrate. You just can’t deliver a good performance when all these problems are tormenting you in your headphones. Or maybe you don’t even hear any of these problems that are causing your auditions to get no response. I have been a professional recording engineer for the past 20 years in the spoken word industry. I have recorded thousands of voice talent for tens of thousands of spoken word productions. I know what a good recording sounds like, and I know when a recording can be better than it is. I know what the problems you are encountering sound like and I can guide you in the right direction to improve your voice over recordings. that could get you working from your next audition? and get more clients while keeping the ones you may already have. A sample of your recording in mp3 format. It could be a recent audition that got no response. It could be a short segment of an audiobook that you are working on. Or even just a fresh read of an old script for the purpose of this evaluation. 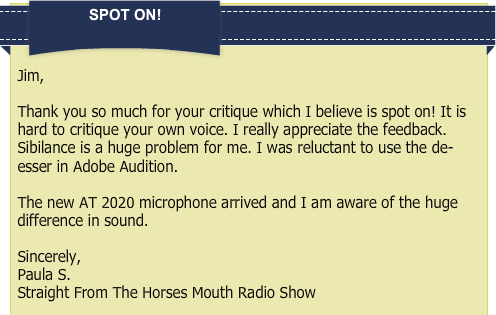 In your email to me, include a breakdown of your equipment – microphone, preamp if you are using one, and recording software so that I may better understand your setup. A PDF document with my analysis of your audio recordings based on my 20 years experience. Technical aspects of your recording that could be holding you back. How your room is responding to your voice and what you can do to “tighten” things up. If your specific equipment is being fully utilized or is it part of the problem. The one thing you can start doing right now to drastically improve any audition. The biggest mistake most talent make when sending an audition to the agency that could be hurting their chances. Are you doing it? and getting calls FROM auditions. Why struggle with getting work from and for your home studio?